Hi everyone! For those of you who live in the USA, I hope you all had a wonderful Thanksgiving! 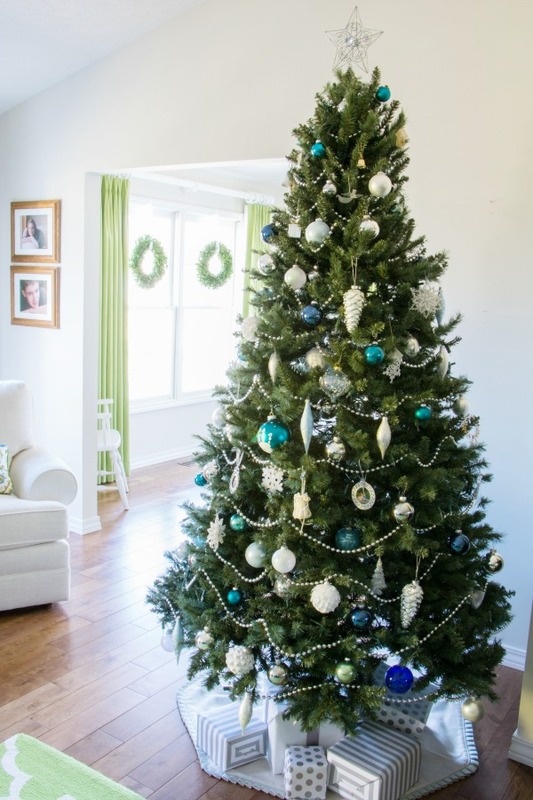 Today, I’m sharing a quick Christmas home tour of our living and dining rooms decorated for the holidays. To be honest, I took these pictures last year after Christmas so that I wouldn’t have to rush to get our Christmas decorations up super early this year! Next week you’ll get a peek at what our Christmas tree looks like this year. The only other time I’ve done a Christmas tour of our home was 3 years ago. We had just finished our home renovation, but I still needed to make all of the fun stuff like the draperies and pillows. 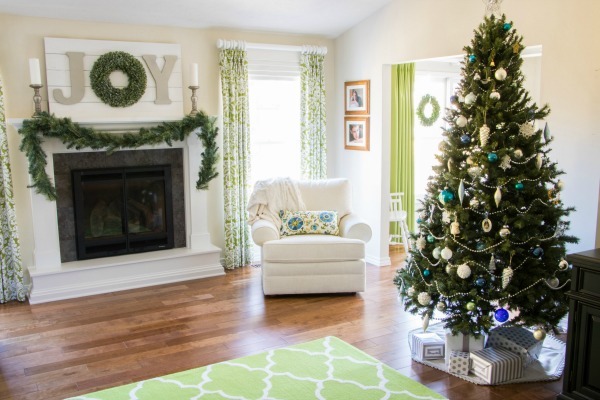 If you want to see what our living room looked like then, you can find that post here. The living room has changed quite a bit since then! Over the years I’ve slowly changed the colors that I use for our Christmas decorations. Mainly I’ve taken out the red decorations. Blue, green, white and silver are the main colors our home is decorated in year round, so those are the colors of our Christmas decorations too. I usually add just a few new decoration each year that either I find on sale or I make myself. This green cabinet sits in our entry way, which opens up to the living room. 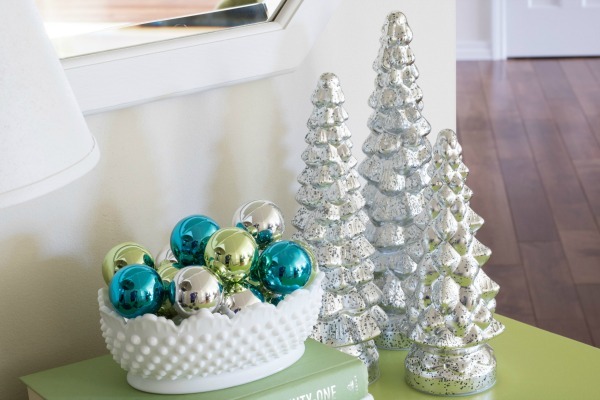 The Christmas blue, green and silver balls are just inexpensive Christmas tree decorations that I placed in the white bowl. 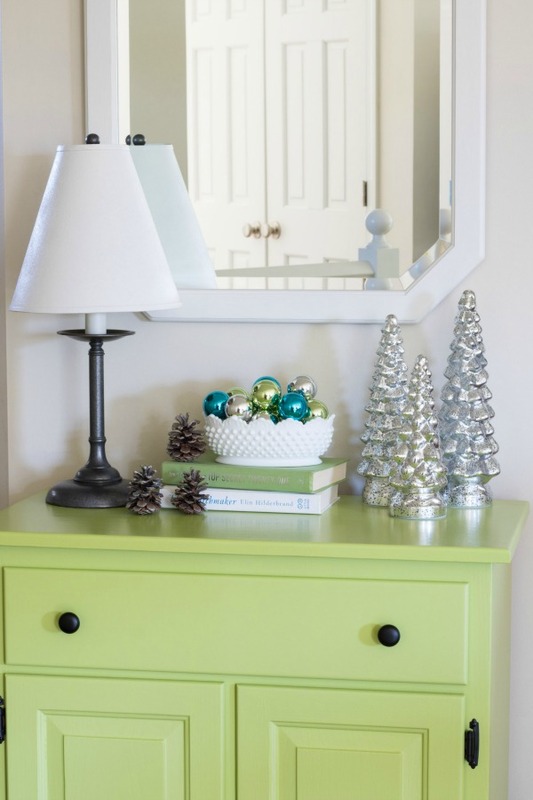 I love how they look with the green cabinet and the silver Christmas trees that sit beside them. I’ve kept the fireplace mantel decorated very simply. 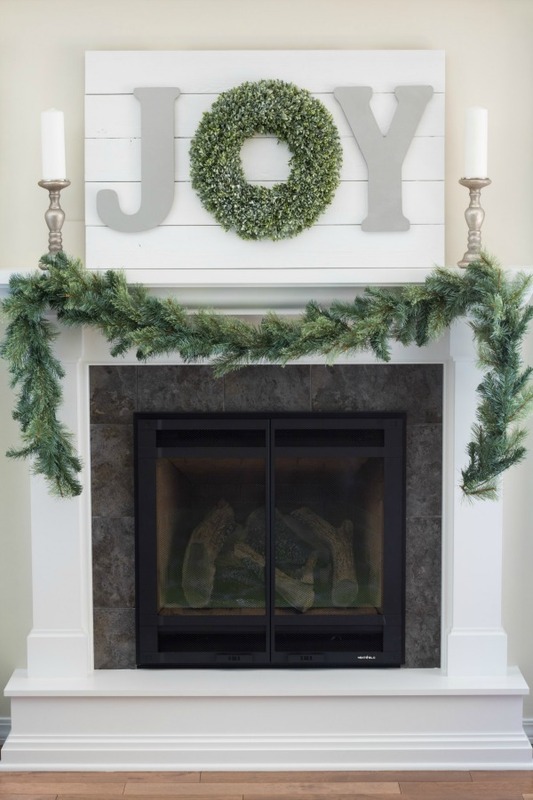 I recently did a blog post about the wall art that I made for over our fireplace. It makes a big statement, and was so easy to make! 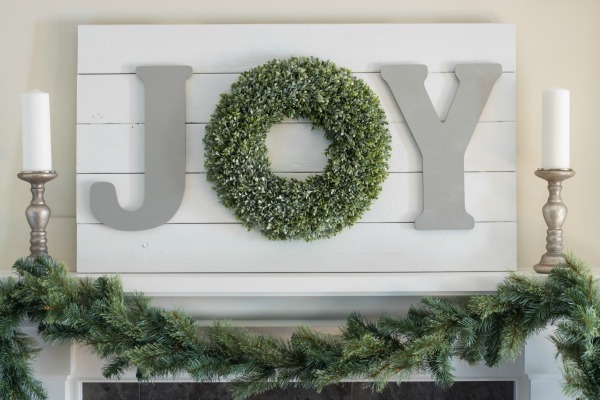 If you want to see how to make this JOY sign, click here. Our Christmas tree is one that we’ve had for a few years. We’ve collected our Christmas ornaments over the 35 years that we’ve been married. We even have some that my husband and I had during our childhoods. The past two or three years I’ve added more of the blue, green, white and silver ornaments for our tree. 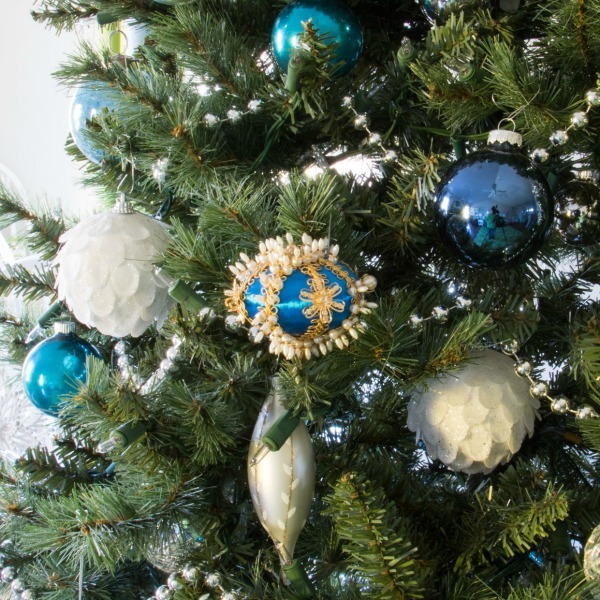 The blue ornament with the pearls is one that my husband made when he was a child. I love getting out the older Christmas ornaments and remembering where or when we got them. When we first got married we were dirt poor. For our first Christmas tree, my mother-in-law handed down to us some Christmas decorations she wasn’t using anymore. The aqua blue ball ornament right above my husband’s ornament is one of the decorations my mother-in-law gave us. I made the Christmas tree skirt that is under the tree a couple of years ago. 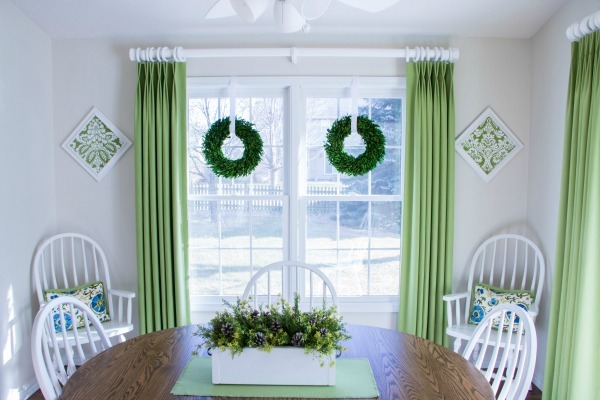 In our dining room, the only decorations I add are the wreaths at the windows and the centerpiece for the dining room table. 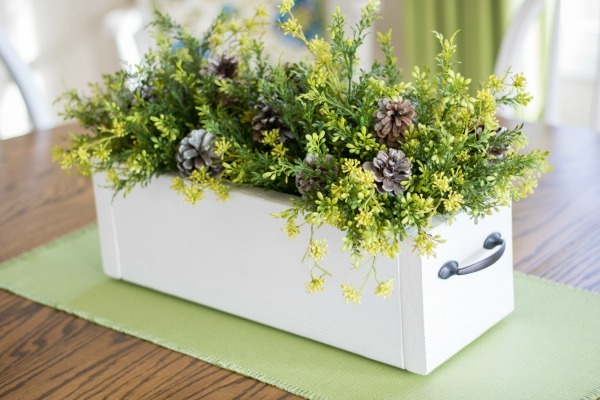 I add greenery and pine cones that are spray painted silver to a planter box that I made from our old deck boards. 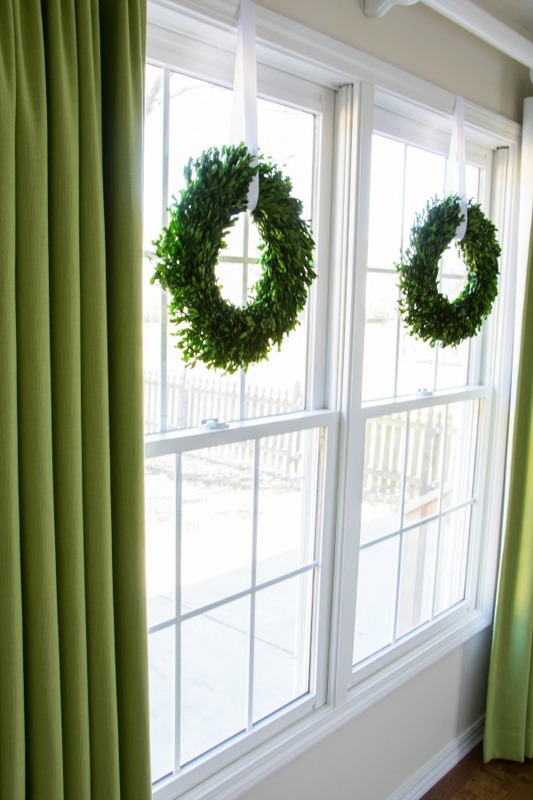 I love the boxwood wreaths hanging from white ribbon in the dining room windows. This was another project that was easy to make, and has a big impact in the room. 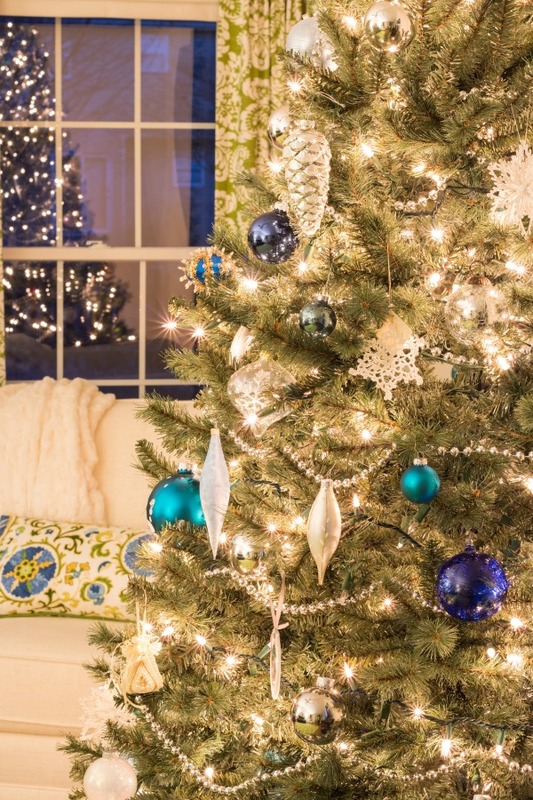 I hope you’ve enjoyed our Christmas home tour, and that you have a wonderful holiday season! 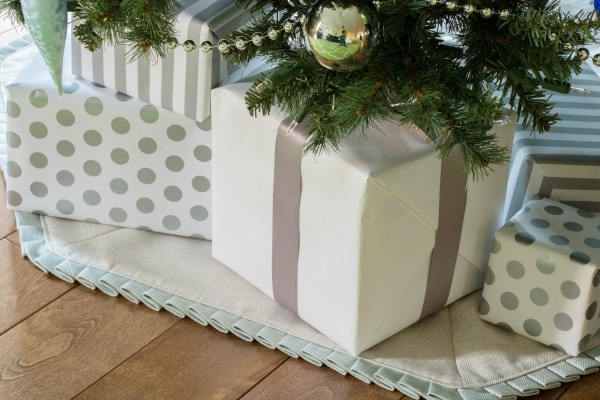 « Great Gifts That Crafters Will Love! Beautiful! Very simple, but festive. I think my favorite is your entry table vignette. Thank you Torrey! I do love the entry table vignette too.